What is Household Hazardous Waste? Household hazardous waste (HHW) is considered unused, used, discarded, or leftover products that are used in any household, which contain toxic substances. Any container that is labeled caution, poisonous, flammable, toxic, corrosive, explosive, and reactive is considered hazardous. These types of wastes are to be discarded properly at a compliant household hazardous waste collection site. Household hazardous wastes should not be thrown out in regular trash receptacles. There are many risks associated with the improper disposal of household hazardous wastes. Including fines, hazardous accidents, fires, explosions, and ground water contamination, which can lead to hazards associated with human and animal health. Check with your local county’s solid waste department for a scheduled household hazardous waste collection site in your area. Household hazardous waste buildings by US Chemical Storage offer safe chemical storage solutions. Dispose of your household hazardous wastes at a household hazardous waste collection site. 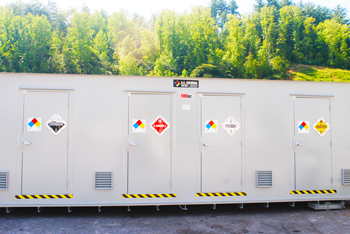 Household hazardous waste buildings by US Chemical Storage offer a safe storage atmosphere for keeping HHW contained, and compliant. Household hazardous waste buildings typically have three separate storage rooms. Separate storage rooms include organizing chemicals by class including flammables, corrosives, and combustibles. Each room is segregated with a solid partition wall that can be fire-rated depending on storage application. Household hazardous waste buildings by US Chemical Storage are designed by professional engineers and constructed by experienced, certified welders for quality assurance. Constructed from heavy-gauge steel for superior strength and dependability. HHW buildings feature a built-in secondary containment sump, a 15-year structural warranty and a chemical and weather resistant epoxy top-coat for protection against extreme weather conditions. Properly containing hazardous wastes at a household hazardous waste collection site can decrease dangerous situations that are involved with improper disposal of household hazardous wastes or other chemicals. Protect your community by disposing chemicals, hazardous products and wastes at a household hazardous waste collection site. Compliant storage solutions for household hazardous waste provides a contaminate-free environment, benefiting human health and the environment.